Yesterday evening(August 13th) in London, Emma Rigby returned to the spotlight joining cast mate Hannah Tointon at the world premiere of 'The Festival at Cineworld Leicester Square. Emma Rigby wore a GIVENCY black long sleeve wool and floral lace evening gown, featuring a mock neckline and a center front split. Her bold red lip and side parted tresses enhanced the appeal of her overall look which was topped off with silver sandals. Hannah Tointon wore a SHIATZY CHEN FALL 2018 pink floral embroidered, dotted layered gown, with a v-neckline. Adding a little sparkle to her look, she accessorized with FOREVERMARK rings & diamond studs. A ponytail and pink lip finished up her look. 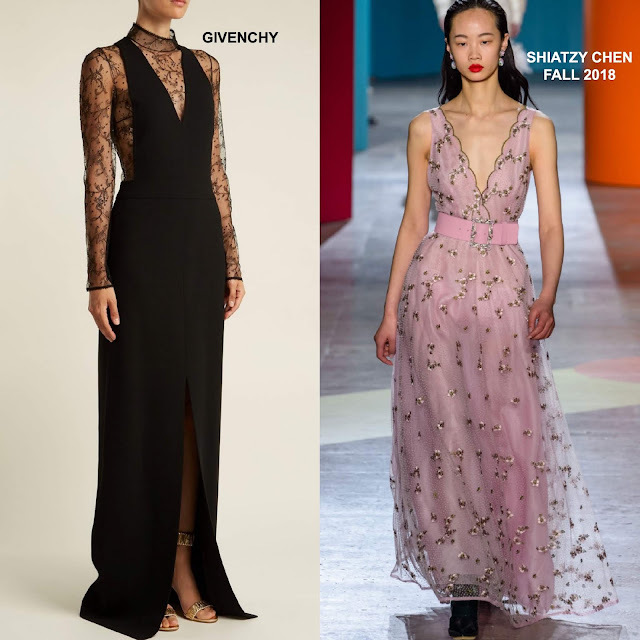 You can get Emma's Givenchy gown at MATCHES FASHION.